If you’ve recently moved to a new neighbourhood, it’s important to search for a new dentist to help safeguard your family’s oral health for the coming years. To ensure you make the right decision for your family’s dental needs, we’re offering our guide on how to choose a new dentist in this latest post. For those with children, it’s particularly important to make sure your new dentist offers emergency services. You should have access to an expanded hours clinic that allows your dentist to take patients outside of regular office hours. This will ensure that any dental emergencies can be resolved before they lead to a long-standing oral health problem. When meeting with the dentist, make sure they have the experience to support your family’s oral health requirements over the long-term. For example, are they experienced in both cosmetic and traditional dental procedures? Do they have a proven record of success in the industry over many years? These are important considerations when reviewing a dentist’s experience. A visit to the dentist’s office is a uniquely personal experience. It’s essential that all members of your family are comfortable with this process. Work with your family to understand their concerns and allow them to speak with the dentist about their unique oral health challenges. This process will give them time to get to know the dentist and help them become comfortable asking the dentist questions in the future. When choosing a new dentist, a leading consideration is the scheduling process. Does the dentist offer appointments on a schedule that suits your family? Can they fit your children in after school or on weekends? Will they be able to provide you with treatment outside of your working schedule? Discuss scheduling requirements and make sure they fit your needs with precision. In choosing a new dental office, work with the dentist to review past oral health issues and get answers on how they would treat you. For example, you might have past problems with cavities. Discuss pre-emptive treatments and the process of having fillings placed to ensure your new dentist is able to offer professional and prompt service. 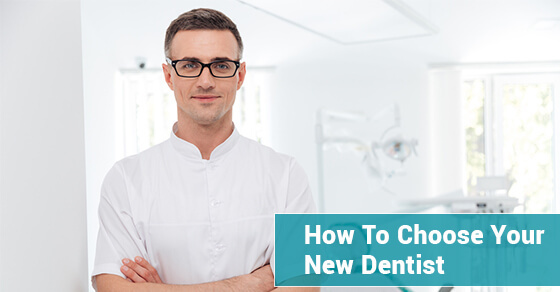 By following this guide, you can streamline the process of choosing a new dentist, and quickly gain comfort with the dentist and their team. To discuss your unique dental health options, please call our trusted team today.